Have you ever eaten fresh pasta you have made at your house from scratch? If you haven’t, then the day you have fresh pasta is the day you stop eating dry or boxed pasta ever again. The difference is night and day between the two. You will be wanting to have it more and more. In order to do this, you will need the best pasta maker you can find on the market. The noodles are so fresh when they are rolled out by hand. You may be thinking that this is going to be a mess and a very difficult task when in all reality, it is very easy to do. Pasta is really only made from 3 ingredients and when the dough is done, the pasta maker will take care of all the hard work for you. You will never need your rolling pin again with a pasta maker. Learn more about how a pasta maker works. 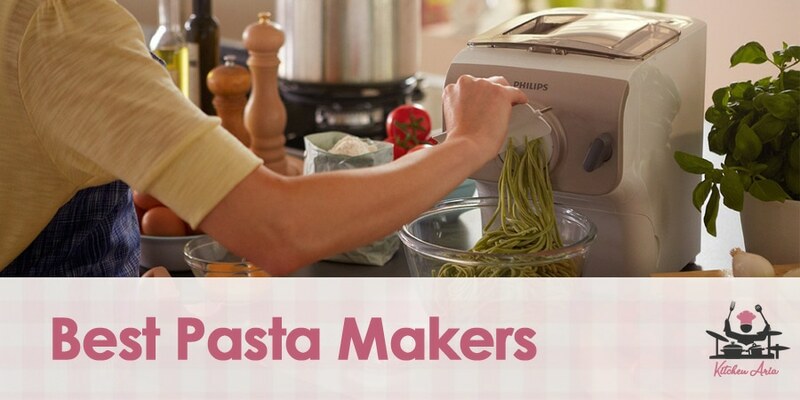 There are all different kinds of pasta makers and each will help you to makes a few of your favorites. Some of these machines are limited though. Very few machines can do more than flat pasta or a couple of shapes. In this article, we will go over what to look for in a pasta maker when looking to purchase one. We will also cover some of the best pasta makers available on the market today. When looking to purchase a pasta maker, consider your options and cross-reference them with your wants and needs. Figure out what kind of pasta you will be wanting to make more often and then go from there. You really do not need a fancy machine to make really good pasta. Most of these machines are very similar with only a few differences. The most common pasta maker consists of two rollers and two settings which are usually attached to a hand crank. These rollers act in the same way as a rolling pin would but stationary. There are some that are electric and will do all of this for you. But sometimes you want to be able to control the speed manually rather than relying on the machine to do it. There are other machines out there that will press the dough into certain shapes like cavatelli or rigatoni. Usually, these machines tend to only do one or two shapes though. But they can be dropped directly into the pasta pot without having to do any cutting. If you happen to find a machine that does more than 2 pasta shapes, it may be a great find. Learn more about the types of pasta you can make. While most of the pasta maker available look the same they may not be constructed properly to last. Or they may be made with a lower quality material which will definitely make one stand out against the rest. You will want the pasta maker to be sturdy and made of solid, high-quality materials. One of the best is stainless steel. The reason being, pasta makers are usually not meant to be washed or touch the water. When you are done with the machine, you wipe it down the best you can then lightly spray the rollers with pan coating to season them. Over time this could hurt the machine so having a nice solid material or exterior will help protect against any rusting. For the most part, the design is almost identical across the board. These machines are not meant to sit out on the kitchen counter like a panini press would but rather to be packed away until further needed use. The important thing is to find a pasta maker you are comfortable with and has great functionality. Make sure the pasta maker comes with some sort of anchor or C-clamp to help keep the pasta maker steady when in use. You will not be able to hold it down yourself so this will come in handy. Make sure the clamp is big enough to fit around the tablespace edge you plan on using it. A warranty will help to protect your pasta maker if it breaks. Most quality pasta machine makers offer a lifetime warranty with their because they are confident it will last forever. If the machine does not come with some sort of guarantee or warranty then it is pretty clear that is a red flag and should not be considered as a reliable product that will outlast the test of time. We start off the list with a great pasta maker from a company who has been around for decades making these types of machines. Cook’s Illustrated referred to this pasta maker as the Ferrari of pasta makers. The machine is artistically made of stainless steel and with exact precision to make sure everything works as it should for a lifetime. The machine comes with a clamp to hold the pasta maker down while in use, a dough cutter and a hand crank to work the wheels. A motor drive piece is available for separate purchase but will fit on the machine with ease and take the hard work out of the process for you. The machine comes with the capability to make three different types of pasta and has the ability to take on more types of pasta by purchasing extra rollers separately. This beautiful, hand-crafted pasta maker has to be one of the best we have ever seen. The Top Dog of Pasta Makers! This pasta maker is the crème de la crème of pasta makers! It does literally everything for you from making the dough to cutting the pasta. This machine is amazing. All you have to do is add the ingredients, set the function and turn it on. It will then mix and knead the dough and when it is ready it will push the dough out into pasta shapes while cutting it the specified length and width. This really does do all the work for you including the cleanup with its patented self-cleaning system with the push of a button. The machine features 4 interchangeable discs for pasta but more can be additionally purchased separately. The discs also store in a small compartment within the machine itself. Here is a pretty basic model of a pasta maker. This machine will do pretty much the basics of a pasta maker and won’t break the bank at the same time. The machine is able to cut pasta into 2 different types of pasta, spaghetti, and fettuccini. But other attachments for other pastas are available for purchase separately as well. The machine is well-built and has a shiny chrome plated exterior. The machine comes equipped with a clamp to attach it to a counter or table for when in use, a hand crank to work the rollers and a booklet on how to make pasta. This machine would be great for a beginner or someone who is looking to just learn how to make pasta. This pasta maker may be better than the last one we just reviewed and it is half the price. You really cannot beat that. The machine has all the same functions mentioned before but instead of chrome plated exterior, it has a stainless-steel material makeup which means the metal will be protected from any rust. The machine has the ability to make three different kinds of pasta with its removable and dishwasher safe roller blades. There are other roller blades available for purchase separately that make other types of pasta as well. This pasta maker is at the bottom because it only makes one pasta, and that is the sheet pasta. Yes, it will roll out the dough in 9 different settings of thickness, but then you have to cut the pasta by hand for whatever shape you want after that. The machine is constructed of chrome plated steel and comes with a hand crank and clamps for stabilizing during the rolling process. This machine is very basic and is not much to talk about, plus it does cost more than you would think without being able to do much. Here is another basic pasta maker but with a few tricks up its sleeve. The machine comes with all the basic stuff like a clamp and hand crank to work the rollers. It also has the capability to make 2 different kinds of pasta aside from the flat pasta sheets it produces. The machine is made of non-toxic aluminum alloy which means it will last a lifetime and make great pasta every time with its smooth rollers. Other roller blades are available for purchase and will attach to the machine with ease. One other great thing about this pasta maker is that it comes with a 1-year worry-free warranty to protect the machine from any defects or damages. If you don’t like the machine, send it back and they will refund your money. This is a really cool little pasta maker and it is really inexpensive as well. However, this pasta maker only makes one type of pasta, but it is a very unique type of pasta that other pasta makers cannot make. The pasta it makes is cavatelli, which is a special pasta that looks like an elongated shell with ridges. These pastas are very hard to make by hand which is why this tool comes in handy. While it can only do one pasta, it does a great job at that one thing. The machine is made from anodized aluminum which makes it very strong and can clamp on any table or counter while in use. The fall back to this machine is that you have to have a pasta maker to initially roll out sheet pasta to feed into the cavatelli roller. Whatever pasta maker you decide to go with, make sure you are comfortable with it. There is a bit of a learning curve to making pasta and getting the hang of it will take some practice. Having the best pasta maker as a tool will help you so much more in the long run. Now go get a pasta maker and start cooking!